The whole thing has been a terrible mistake. I can see that now. I'm unpacking a large box of books that Literary Friend (dovegreyreader) has begged or bullied off authors for my Macmillan coffee morning. They're wonderful and I can't have any of them. There's boxed editions of Susan Hill's books, a boxed facsimile of a story written and illustrated by John Betjeman as a child, large colourful children's books by Meg Rosoff and Adele Geras and paperbacks by all three, every one of them signed. I ring Literary Friend. 'I want them all' I wail. 'So do I' she agrees, 'but I've counted them' - here her voice takes on a warning note - 'and if they're not all on display for the auction or the raffle I'll know.' You don't mess with Literary Friend. After a last lingering look I go to the computer to compose blurbs to place alongside the books, just in case people don't realise what gems they are. The biogs turn out to be truly amazing - Whitbreads and Carnegies abound and that's before I even start on the other awards. I'm just pondering the possibility of vaguely implying that I hover around the fringes of this illustrious literary circle should anyone ask, when I'm brought down to earth by the bleeping of the reminder on my mobile. My rendez-vous with the village hall tea urn lady. When I get there she's standing expectantly outside the hall. As I park she disappears and emerges with the urn. 'If the light goes out' she says darkly, as we stow it into the boot, 'Just tip it on its side and press the switch on the bottom.' I'm still mulling this over when she adds, 'after emptying it of course.' I drive home, bleakly wondering if it might just be easier to serve up 45 coffees with a rotating conveyor belt of kettles after all. On the day the sun shines, the tea urn behaves itself and the coffee and conversation flow. The cake stall, craft stall and raffle all seem to be doing a brisk trade. My biggest worry - how to squeeze everyone into one of our small rooms for the auction - is solved. We fling open the doors and everyone spills happily out onto the warm patio. Literary Friend who writes a daily blog, and is therefore much quicker off the mark than me, has already written about it all in her own inimitable style. As I know some of you read both her blog, http://dovegreyreader.typepad.com and mine I'm going to lift those passages straight out. 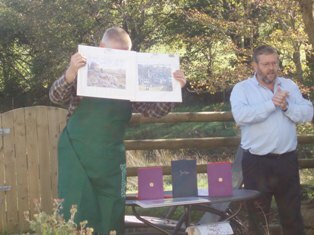 As well as a raffle at the Macmillan Coffee morning there was also an auction and the weather so perfect today it was held in the garden.Amongst the most sought after lots some signed boxed editions generously donated by Long Barn Books as well as paintings by local artists. The men donned their aprons and turned out in force for the event. Bookhound took to the kitchen sink and the washing up as if he'd been doing it all his life and Mr Gettingitoffmychest did a fabulous support act as auctioneer's assistant.Sue Ward's superb pictures fetched great prices once Mr GIOMC held them up the right way.There had apparently been no need to carry out threats to burn down Robin Armstrong's Lopwell Studio, he contributed one of his beautifully detailed paintings most willingly and fierce bidding erupted out of nowhere between a previously happily married couple. They are probably now arguing about where to hang it and I still can't remember who won. I doubt Susan Hill's books have ever been described more eloquently or sold more persuasively than by John, who had secretly heard Susan being interviewed about her latest book on the radio the day before and was suddenly the world's expert, stunning us all with his preparation and knowledge.Cash in the Attic and Flog It have nothing on this man, he is a natural with the gavel and developed the happy knack of adding an extra ten pounds to the price for every twitch and scratch he could spot. 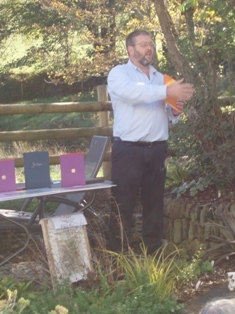 Bidders then cajoled again with the carrot of the free box to keep the book in. Much laughter and jollity and a great sum of money raised from a small gathering who all remembered with great fondness the absent friend much-missed by all who was to have been there too. For my first dose of Herceptin I have to stay in hospital all day to be monitored in case I have an allergic reaction. I drove myself to radiotherapy every day, but unsure how I'll feel after the Herceptin Husband takes me in. We're ten minutes into the journey when I realise I've left my glasses behind. This is a major catastrophe. I'm going to be hooked up to an intravenous drip for six hours and I'll be unable to read. I yelp in horror. Husband slams the brakes on, nearly standing the car on its bonnet and asks if I want to go back. I consult my watch and decide there's no time. I find myself back in Alice in Wonderland territory, the same room I had for my first chemo, the one with the huge clock. I suspect I'm going to be watching it rather a lot. The nurse can't get into a vein - chemo has played havoc with them. She abandons the first effort and the second goes into the tissues. Her third attempt, into a tiny awkward one, seems to work. I explain my non-glasses predicament and she takes pity on me. 'I'll lend you mine' she says, adding apologetically, 'But I'll need them back for work at some stage.' I agree, having decided on balance that checking chemo drugs is marginally more important than my su doku, and get on famously with them till she returns part way through the morning to claim them back. Reluctantly I surrendour them, abandon the papers and switch on the TV. We're busy viewing a house in Birmingham. To buy or not to buy is the question. After lengthy deliberation I decide against it. Next programme I'm scouring an old lady's home for antiques to flog and promptly bid back for them in the auction rooms, though I pass on a German soldier's helmet from the first world war. I have a brief interlude with the news and then we're plunged headfirst into the agonising relationship traumas on Ramsey Street. After successfully diagnosing atrial fibrillation in a grumpy old man in 'Doctors' I really have had enough and go back to a rather fuzzy su doku. After six hours I'm deemed not to have had a reaction, thank goodness, and the drip is dismantled. As I leave I talk to one of the nurses who's just completed a triathlon to raise money for the chemo unit. She points out an impressive array of photos on the wall taken by her colleagues. She's wading into the sea, swimming off to the horizon, getting on her bike, cycling furiously, dismounting and eventually running, jubilant, to the finishing line. I admire them and, exhausted, stump up double the amount I'd originally sponsored her for. On the outskirts of our town there's a little cottage hospital, an ugly redbrick Victorian pile, built through public subscription. Inside it's been revamped and renovated. They've kept, I'm glad to say, a large wooden plaque half way up the stairs listing all the original benefactors at the turn of the century, together with the size of their donations down to the penny. Last year when my mother was a frequent inpatient I often used to wonder how those who had (and perhaps could only) donate small amounts felt when the world could see the exact amount of their gift. Maybe that was the idea - the early twentieth century version of media pressure? Old fashioned though it may look on the outside there's actually quite alot going on. In addition to a couple of wards there's a minor injury unit, physio, X-ray and occupational therapy departments and numerous outpatient clinics. Recently added to the list is our very own chemo outreach clinic and as it's the first in the county the BBC regional news unit descend on us to do a feature. A friend, who'll be having chemo that day, tells me she's going to be on. 'I'll be wearing my purple wig' she informs me. She has a series of wigs in various outrageous colours which she rotates depending on her mood. What breathtaking confidence! She makes me feel so dull as I scuttle around in my as-near-as-I-can-get-to-my-own-colour wig. I put it down to youth. She's twenty years younger than me. An appalling silence has descended on the house since the family left. The lid to the marmite jar has mysteriously vanished without trace and bits of jigsaw lurk in the veggie rack. Fortunately Sister-in-law and Brother-in-law come to stay for a few days, so the house is full again. It's Mother's actual birthday and we have a repeat session at the pub. All goes well. She enjoys her prawns and baked potato and a spritzer, so weak it reminds me of homeopathic medicine, diluted until it only contains a 'memory' of the active ingredient. Sister-in-law has done a wonderful job bringing down a cake and we give her the works - lighting candles, singing Happy Birthday and taking photos. Well it's not every day you're 96, is it? As well as the cake Sister-in-law has brought down a lamb casserole and some stewed apples, for which she says she'll make a crumble. I hear her pottering around the kitchen and when I go in I'm horrified to see on the worktop my old fashioned scales from the utility room that I use for weighing stuff for the garden. Last time I used it I was working out the dose of some weedkiller. 'Oh my God' I shriek. 'Please don't tell me you've used those for the crumble!' 'Yes' she replies, looking alarmed. 'Why?' I explain. 'I did wash the scales first' she says. We eat a very subdued lunch. What do I do tonight? I don't think I'll be able to bring myself to eat the crumble but I don't want to upset her. Brother-in-law, who has a degree in chemistry, spouts supposedly reassuring science at me - something about things being soluble or not soluble, none of which I can take in. It's no good. I just feel I don't need to be ingesting nano-molecules of weedkiller or even the 'memory' of nano-molecules. Thankfully Sister-in-law takes matters into her own hands and, as we clear up, throws the offending crumble in the bin. I could hug her. They go out for the afternoon and I hastily rustle up some more crumble before they return. It's the least I can do. In the evening we drink some bubbly before dinner. Having just booked to go to Madeira together at the beginning of next year we drink to finishing chemo and to the holiday. By then I'll have hair again. I'll be swimming again. I'll be - amazing thought - 'normal' again. Please note - we're going away to Wales for a little break and as I don't have a 'publish later' option I won't be posting anything next week. Normal service resumes the following week! It's Mother's 96th birthday next week, so whilst the family are all here we plan an advanced birthday lunch at a pub near her home. I'm dreading it. Last time I took her there she fell as we were leaving - face down into the gravel where she lay spreadeagled across the doorway till the ambulance arrived. The pub owners were marvellous, covering her with a blanket and, as I'd taken off my fleece to put under her head, lent me an enormous anorak which I flapped around in for hours at A and E, getting strange looks. I needn't have worried. Lunch goes well. Grandson sits opposite her and is fascinated by the fact that although he's just graduated from a spoon to a fork, she's apparently gone in the opposite direction, using a spoon for her prawns. We tell him that Great Grandma can't see because her eyes don't work. According to Son Grandson's usual response to things not working is 'New batteries Daddy.' We all laugh, but thinking about it it's not such a ludicrous concept. After all batteries (for her hearing aid)make her ears work. A week in termtime seems a good time to visit the local aquarium. After my radiotherapy we all meet up at the harbour front. Sure enough the aquarium's almost empty. Grandson peers at fish of all shapes and sizes: from vicious looking sharks and sleepy giant turtles to delicate little sea horses and electrifyingly vivid tropical fish. Between tanks he tears happily up and down the deserted ramps rounding up the stragglers in our party like an enthusiastic sheepdog, telling them excitedly what delights the next tank has in store. We get home to find the bullocks in the neighbouring field. Husband suggests to Grandson they go to see them. 'Can we just call them cows?' asks Son. 'Why?' we ask. 'Think about it' he says, 'if he tells them at nursery that Grandad took him down to the bottom of the garden to look at his bullocks, we'll have Social services knocking on the door before the day's out!' He has a point. 'Cows' it is. I'm putting Grandson to bed. After the bedtime stories we talk about what we've done during the day and I ask him which fish he liked the best. He thinks for a minute. 'The cows' he replies. Having had my radiotherapy 'simulation' I'm now having my 'verification.' I'm on the couch and having measurements checked by a machine, computer, laser beams and thankfully three human beings. The machine above me glides silently from side to side. I'm getting used to that but am startled when another one suddenly pops up out of nowhere. 'Just a camera', I'm assured by one of the radiographers. I have to say if it is taking photos of me (and I have to take her word for it) it's alot less painful than my recent efforts at a new passport one. That had to be redone no less than three times due to rogue splodges on the film. I take a squint at the computer screen. Of course it's complete gobbledegook. There's a list of words down one side and a column of figures down the other. The only words that jump out of the jumble at me are 'coll rot'. Having discounted rotting collarbones I decide 'rot' could be rotation but am totally beaten by 'coll'. I don't ask the radiographers. They're friendly enough but I want them concentrating on the task in hand without distraction from my inane questions. A decimal point in the wrong place is the last thing I need. Son, daughter-in-law and grandchildren come down for a week's holiday. Daughter also joins us. Amazingly for mid September we have some gorgeous weather and we take ourselves off to the beach for the day. Although the surf schools are still in evidence, as are the lifeguards, the beach itself is wonderfully clear - just a few families like ourselves with young children. We settle ourselves against some rocks. Grandson (aged two and a half) is wild with excitement. There's a tiny rockpool nearby and for about an hour he busies himself grabbing handfuls of sand from a nearby stream and running across to dump it in his rockpool. We watch, amused. As Son says, it's a tough job transporting sand across the beach, but someone has to do it. After a picnic lunch we go to investigate my favourite rockpool (where Son and Daughter spent many happy hours when they were little) only to find it's disappeared, silted up with sand. Daughter (the surfer) assures me it's due to tides and winds and only temporary. Relieved we make our way down to the sea where Grandson plunges in, jumps waves with us and, despite getting freezing cold, refuses to come out. We manage eventually to drag him out, shivering, on the promise of an ice cream. The van is a long way off, but Grandson carries his in both hands all the way back, stopping to lick it every now and then. 'Careful' I keep saying, convinced he'll drop it. When we get back Daughter-in-law puts an extra top on him while I offer to hold his ice cream. What do I do? I promptly drop it. I still can't quite believe how I did it. I mutter something about after-effects of chemo and offer Grandson mine. Son steps in, passing his over and won't take mine, leaving me feeling thoroughly guilty. When we pack up to go Daughter picks up her new pre-ordered, tailor-made surfboard. As it's strapped to her car roof I gulp at the size of it, but choke back my worried motherly whittering. I decide to turn my attention to Granddaughter (eight months old) instead. In the couple of days she's been down here she's started feeding herself and her first tooth has appeared. Her hair is beginning to grow too. I inspect her head with a rather jaundiced eye. Still, I reassure myself, I'm still ahead of her in the tooth ratings.